I finally stopped putting it off and took the opportunity to test myself on the Acquia Certified Developer exam. To be honest I put it off for quite long. As a household name in the community I had fears it will prove I am not good enough and funnily enough, I did worst on back end development (ooops!) and 10% better on site building. My overall result is actually the same as Angie Byron at 85%. I'm flawless with fundamental web concepts at least. Ha! As a computer science major who transferred into more of a mix of development, leadership, events and content production, I don't have much of an experience with tech certification exams. My only encounter was with the CIW certifications 13 or so years ago, which I took back in the day to be able to teach the CIW courses at a local private school. Judging from that experience and common wisdom, I expected paperbook style questions where I need to know the order and name of arguments and options on l() as well recite row styles of views and available options of date fields. The reality cannot be farther from that. Up to date as of October 29th, 2015. 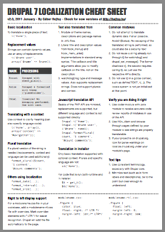 In the introduction to content and configuration translation piece we discussed what is considered content in Drupal 8. This is a somewhat misleading term because custom blocks, custom menu items and even user entities (user profiles) are considered content in terms of their implementation. Content is always stored as entities. The main difference between configuration and content entities is configuration is usually created on the backend (think views, vocabularies, etc.) while content is usually created on the frontend (think free tagging taxonomy terms, comments, blog posts). This is not a black and white differentiation but it helps think of the categories. The other key differentiator is content entities usually get to have configurable fields. You can add new fields to user profiles, taxonomy terms or comments. Again there are exceptions, for example custom menu items cannot get configurable fields in core. Finally, there are even content entities that will not be stored, in Drupal 8 contact form submissions are content entities that live only until they are sent via email. For this tidbit we are concerned for content entities that are stored and multilingual. Whew! 2014 was a fantastic year for the Drupal multilingual team. We had some great events with huge sprints, including but not limited to: Global Sprint Weekend, the amazing Drupal Dev Days Europe, NYC Camp, DrupalCon Austin, DrupalCon Amsterdam and BADCamp. A fun fact about people on the multilingual team is that even though we usually turn out in big numbers at sprints, there are numerous great mentors among us, so we don't work on code that much at mentored sprints. We do a great job helping people get started and move into more serious core work though. Our most famous mentee this past year is 2014th Drupal 8 core contributor Holly Ross, Executive Director of the Drupal Association who contributed her first and second core patches fixing multilingual issues. After over a month of concentrated work, Drupal 8 was ready today to finally flip the switch and enforce strict configuration schema adherence in all TestBase derived tests in core. See the announcement in the core group. If you are a Drupal 8 contrib developer and provided some configuration schema earlier (or you integrate with an existing core system like blocks, views, fields, etc.) then your tests may now fail with configuration schema errors. Unless of course all your configuration schema is correct: #highfive for you then. Otherwise I thought you'll have questions. There is of course the existing configuration schema documentation that I helped write. 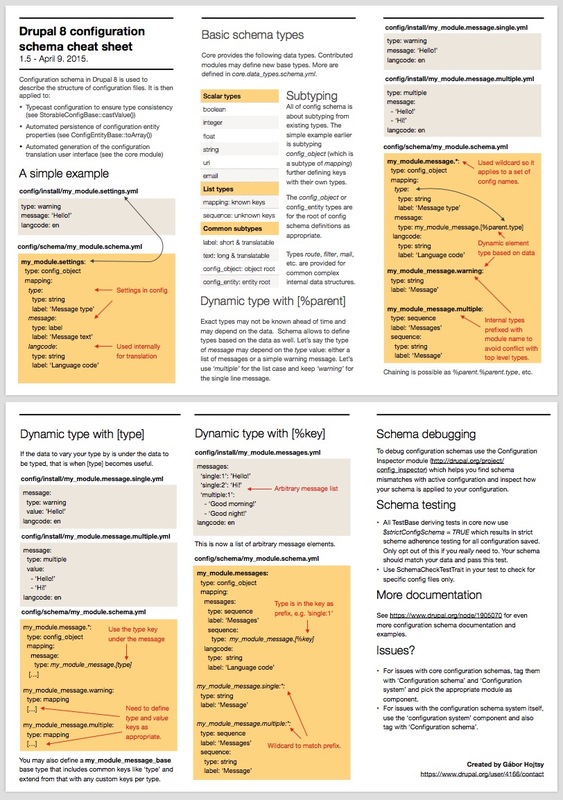 However if you are a visual person and want to get an understanding of the basics fast, I thought a cheat sheet would be a great tool. So sat down today and produced this one in the hopes it will help you all! Enjoy! Please provide feedback for improvements in the comments, and I'll update the sheet as appropriate. I just had the time to watch Larry Garfield's DrupalCon Amsterdam core conversation on managing complexity today. I did not have the chance to attend his session live due to other obligations, but it is nonetheless a topic I am very interested in. The key point of the talk in my understanding is the Drupal community needs to decouple and be component based (evolving around more independent components), so responsibility and authority is distributed and local. Larry specifically calls out that Drupal 8 initiative leads and component maintainers are "glorified secretaries" with responsibility but no explicitly granted authority. I am not a native speaker and although I had an idea, I wanted to clear up what authority would mean. According to Google the power or right to give orders, make decisions, and enforce obedience. (I'll use hard power as a synonym). Larry alludes to parts of this definition in the talk with examples. While the talk is well worth the hour to get insights form one of the Drupal 8 initiative leads on some of the struggles we had in the Drupal 8 cycle so far, I think there are fundamental issues with the premise. The biggest fallacy is the gross generalisation and picking one facet out of a very multi-faceted situation, so the proposed solutions don't stand deeper scrutiny.